Shuttle Art is THE FIRST band who creates more than 100 unique gel pens. Our creative spirit shares the same to yours on works of art. Similar people must think the same. The colors we select must be loved by you too. Shuttle Art 40 Colors Glitter Gel Pens contains 40 INDIVIDULE,ONLY GLITTER colors. 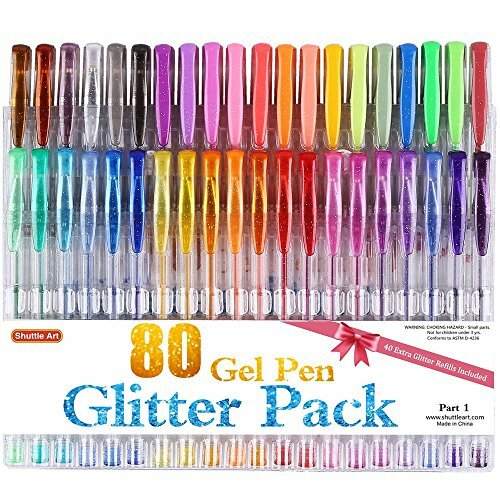 No other color type, exclusive selection of glitter gel pens only , the best choice for glitter fans. Delicate color box with trays inside packing provide easy selection for customer and good protection for pens. There is also color list printing on color box which shows all the 40 unique colors contain inside.Delicate packaging makes it perfect as a gift. Children, friends and family members will be excited when they receive this amazing gift. Shuttle Art provides more than 100% Satisfaction Guarantee to customers. We not only provide a refund but a full satisfied service. THE MOST COLORS of single GLITTER pack: Shuttle Art 40 Glitter Gel Pens contains 40 INDIVIDULE glitter + neon glitter colors, enjoys the most on Amazon! Each pen enjoys a unique color, which brings much more fun for Adult book Coloring, Scrap booking, Sketching, Doodling, Drawing, Writing, and all the other art designs. GLITTER ONLY: All the pens are with glitter powder that meets the special requirement for glitter fans. Makes you lost in the glitter world! CUTE PACKING: Convenient and easy taking. SUPERIOR QUALITY: Long lasting, durable tips, smooth writing, non-toxic, acid free.